This post is written by CompTIA, a Diamon Level sponsor of the 2018 Advance CTE Spring Meeting. Currently, there are more than 600,000 open IT jobs and not nearly enough qualified candidates to fill them. Does anyone anticipate this number going down? We certainly don’t. As everything becomes more and more connected—lightbulbs, appliances, smart grids—the need also increases to maintain and secure these connections. In addition, IT is everywhere! There is NO industry which doesn’t have IT needs. A great way to visualize the size of the skills gap is to visit the website www.CyberSeek.org. This site was developed from a grant from the National Initiative for CyberSecurity Education (NICE) and data from Burning Glass. The site includes very recent job data to illustrate the need for qualified cyber workers by state, region and nation. There is also a cyber pathway tool that shows specific cyber jobs, salaries and openings in the US. We need to work together to help students and educators understand the vast opportunities in technology careers. Employers are looking for candidates that can demonstrate the skills needed to fill technology positions in almost every industry sector. Providing students with the proper preparation AND an industry-recognized credential will help them stand out during their career search. Keeping skills current and relevant is a challenge, but one answer is to ensure that they obtain Industry-Recognized Certifications. More than 72 percent of businesses say they believe IT skills certifications are becoming more important. Combine classroom-based instruction with work-based learning opportunities—apprenticeships, visits to local businesses, etc. CompTIA Instructor Network community to network with other teachers and provide webinars on how to teach our certifications. Working together, we can help students get started towards an exciting career in the tech industry. Please stop by our tabletop to learn more. This post is written by the Oracle Academy, a Diamon Level sponsor of the 2018 Advance CTE Spring Meeting. Reflection #1: CTE continues to evolve to meet changing needs. State and District leadership continue to strive to build sustainable and real-world CTE Pathways that lead our students to college and career success. It’s the CTE leadership that can both anticipate and leverage, through research and relationships, the corporate workforce need and then translate that need into CTE pathways for students to pursue. Many of these pathways include applicable industry certifications, apprenticeship/internships, and defined articulation programs with feeder post-secondary institutions. At Oracle Academy, we work to ensure our resources continue to support the needs of CTE leadership through curriculum and certification opportunities that reflect industry needs. Reflection #2: Collaboration between local industry and education leadership continue to drive CTE student success. This isn’t a new concept but what I’ve noticed is an uptick in our education and industry leadership working together to create applicable internships, apprenticeships, and mentorships to support the interest of our students. I’ve heard over and over again the importance that these roles play in supporting and creating sustainable CTE programs. At Oracle Academy, our role revolves around building the best classroom resources for the student and teacher so that their content knowledge and often times, confidence, is foundationally strong so that attainment of first time internships and/or apprenticeships are successful. Reflection #3: A focused effort and persistence will prevail! As we all know, the Carl D. Perkins Career and Technical Education Act is critical to ensuring that quality and sustainable CTE programs meet the changing needs of learners and employers. This act works to improve the academic and technical achievement of CTE students, helps to strengthen the bridge between secondary and post-secondary, and balances the student need with that of a new economy. As parents, educators, and leaders, it’s our duty to encourage organizations, like CareerTech, that advocate on behalf of CTE programs as well as the teachers and students dedicated to CTE success. Oracle Academy supports this mission by continuing to provide our world-class student-facing curriculum and educator professional development – aligned to the IT Career Cluster Pathway – for FREE. Two years ago, we introduced Oracle Certified Junior Associate certifications in database and Java; these certification exams align to our Java Foundations and Database Foundations courses and are specifically designed with students in mind to help support internship, summer job, and first job applications. Oracle Academy exists to improve the computing technology skills of young people, globally! If we strengthen the computing technology pathway between secondary, post-secondary, and career, we are essentially strengthening the future for our children! Career Technical Education holds a very special place in my heart and I hope this blog reflects both the love and respect that I have for CTE programs and its significant impact on student achievement! Two Webinars Digging into Federal and State Policy: Register Today! Last year marked a big year for Career Technical Education (CTE) in the federal policy arena. The U.S. House of Representatives passed a reauthorization of the Carl D. Perkins Career Technical Education Act of 2006, the House Committee on Education and the Workforce passed the “Promoting Real Opportunity, Success and Prosperity Through Education Reform” (PROSPER) Act, an update to the Higher Education Act, and states submitted their plans for implementing The Every Student Succeeds Act (ESSA). Amidst all this activity, an omnibus appropriations bill for Fiscal Year 2017 passed Congress and a sweeping tax reform bill was signed into law. Join us on for a webinar to recap the federal policy highlights of 2017 and their impact on CTE. Participants will hear from Kimberly Green, Executive Director of Advance CTE, Kathryn Zekus, Senior Associate for Federal Policy at Advance CTE, and Debbie Mills, Director of the National Career Pathways Network. The national profile of CTE continued to grow in 2017, with nearly every state adopting new policies related to CTE and career readiness. From redesigning accountability systems to expanding apprenticeship opportunities, state leaders are working to connect learners at all levels with seamless pathways to meaningful careers. This webinar from Advance CTE and the Association for Career and Technical Education will unpack findings from the State Policies Impacting CTE: 2017 Year in Review report. The webinar will explore recent trends in state CTE policy and examine how the CTE policy landscape has changed over the past few years. Participants will also hear from state leaders and explore policy developments in their states. Posted in Advance CTE Announcements, Advance CTE Resources, Meetings and Events, News, Publications, Research, Resources, Webinars | Comments Off on Two Webinars Digging into Federal and State Policy: Register Today! Celebrate innovative and effective programs of study during our 5th annual Excellence in Action award ceremony and luncheon. Register before February 9 and receive $100 off your registration. Note: Once again this year, Advance CTE attended the CareerTech VISION conference hosted by our partners, the Association for Career and Technical Education. What follows are our staff’s highlights and favorite moments. Students and parents involved in CTE are overwhelmingly more satisfied with their education as compared to those not involved in CTE. The session room was packed with more than 70 teachers and administrators seeking to learn how state and local leaders are tackling the CTE perception challenge. One state example included Maryland, which recently released a social media guide to be used in districts across the state. Additionally, we were excited to put together a session that highlighted two of the 2017 Excellence in Action award winners, hailing from Tennessee and Mississippi. The award, which recognizes innovative and impactful programs of study across the 16 Career Clusters, provides Advance CTE with the opportunity to highlight exciting programs that serve students with the academic and technical knowledge and skills they need to be successful in careers of their choosing. Tyra Pilgrim, CTE Coordinator for Rutherford County Schools, presented on Oakland High School’s Mechatronics program and winner in the Manufacturing Career Cluster. The Mechatronic program, in its fourth year, was developed through collaboration with the school district and employers including Bridgestone and the Manufacturing Leadership Council. Pilgrim cited partnerships with postsecondary education and industry leaders as a key component to a program that provides students with pathways to both college and careers. She backed up the program’s success with compelling data demonstrating student achievement, including all students earning postsecondary credit and graduating high school, and 94 percent enrolling in postsecondary education and earning industry recognized credentials. Eric Williams, Assistant Director, Emergency Medical Technology, Jones County Junior College (JCJC), followed Pilgrim’s presentation with an overview of Jones County Junior College’s Emergency Medical Technology program, a winner for the Health Sciences Career Cluster. JCJC, a model for rural postsecondary education in the south, requires learners to participate in 500 hours of training under the direct guidance of an industry expert and offers seven industry recognized credentials. Williams boasted that students have a 90 percent first-time pass rate on the professional qualifying exam, which far exceeds the national average of 60 percent. Williams similarly highlighted partnerships as a critical component, not only with industry and secondary education, but also with community organizations. Throughout the year, he attends events ranging from blood drives to Halloween parades to get the word out about JCJC and more effectively market the program. This has resulted in an increase of participation from two students when Williams took over the program, to a yearly participation rate of 25, the cap for the program of study. Both award winning programs provided attendees with two examples of exemplary programs and insights into how to effectively build a successful program of study. 76% of Americans say middle or high school is the right time to start exploring career options, compared to just 7% who say college is the right time. CTE helps learners find their passion and prepare for the future before investing in their postsecondary education. A new article on Education Week, explores the ways in which learners gain critical skills such as communication, critical thinking, problem solving and teamwork they need to be successful in a global economy. Read about how CTE and project based learning can be used as a potential strategy to help learners in gaining these skills. Join a webinar on December 13 from 1 – 2:15 p.m. ET to learn how state leaders can align labor market efforts with the education pipeline to provide students with the academic, technical, and employability skills they need to be successful in the workplace. Aligning the education-to-workforce pipeline can help increase cost-efficiency, promote coherence, and produce better outcomes for students and workers. This webinar will highlight three forthcoming CCRS Center resources, Developing a College- and Career-Ready Workforce: An Analysis of ESSA, Perkins, and WIOA. Safe Students, Safe Workers: Construction Safety Programs in Post-Secondary Career Technical Education Webinar: Learn what post-secondary Career Technical Education programs (CTE) in construction are doing and how to support development of students’ skills for safe work in the classroom and on the job. What administrative systems, instructor support, curriculum content and teaching activities are needed? Presenters will share concrete examples and results from site visits, interviews, and a national survey of instructors and administrators in construction CTE programs in 2-year colleges, as well as action steps and resources for administrators and instructors of CTE programs from a new guide. Submit a proposal to the 2018 Linked Learning Convention. The Convention brings together more than 900 leaders from education, workforce, research, policy, and nonprofits for strategic conversations and meaningful professional learning aimed at ensuring all students are well prepared for college, career, and life. CNA recently released its interactive labor market analysis tool, which is intended to help CTE stakeholders identify high-wage, high-demand careers and associated education and/or training requirements. The tool was created using data from the Bureau of Labor Statistics’ national job projections until 2024. In the spring, Advance CTE conducted focus groups and a national survey with parents and students to explore their attitudes towards Career Technical Education (CTE). 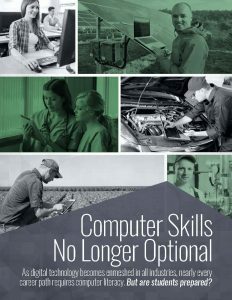 Detailed in the recent report, “The Value and Promise of Career Technical Education: Results from a National Survey of Parents and Students,” Advance CTE found that students involved in CTE, and their parents, are extremely satisfied with their education experience – from the quality of their courses to the opportunity for work-based learning. Additionally, those not involved in CTE want more of these same opportunities, which we know CTE can provide. Four states piloted the messages developed through the research in a series of onsite and online events with the goal of increasing enrollment into CTE programs of study. On September 7, join us from 3 – 4 p.m. ET for a webinar to hear how two states, Maryland and New Jersey, developed their recruitment strategies and activities, utilized the messages and research, and empowered educators, employers, administrators and even students to carry out the messages to middle and high school students and their parents. Space is limited to be sure to register now! This post is written by the Certiport, a Diamond Level sponsor of the 2017 Advance CTE Spring Meeting. It’s easy to think of the millennial generation, those born roughly between 1982 and 2002, as tech-savvy digital natives — and in many ways they are. Immersed in consumer technology since birth, today’s youth has mastered the art of the swipe, the selfie and social media. So it may come as a surprise that millennials often lack essential digital skills needed to succeed in the workplace — be it a conventional office setting, an au to mechanic’s shop, or in a tractor on a farm. Digital technology has extended its reach into every field imaginable — and it isn’t limited to white collar careers. Ninety-six percent of working Americans use new communications technologies as part of their daily life, while 62 percent use the internet as an integral part of their jobs.1 Nearly all industries today require at least some on-the-job interaction with a digital device, including sectors the general public often doesn’t consider technology dependent. Basic digital literacy skills are requisite in virtually every industry everywhere you go, but students often enter the workforce without them. This is why performance-based digital literacy certifications — such as Certiport’s IC3 Digital Literacy Certification — are critical for both employers and students. We invite you to read more about the need for globally-recognized, third-party validated digital literacy skills in the issue brief that will be included in your Advance CTE Spring Meeting conference bag. Please join us Tuesday evening for drinks and discussion at our hospitality suite (Room 825 at the Omni Shoreham Hotel) from 5 to 7 PM. Click here to RSVP. We look forward to visiting with you at the Spring Meeting.